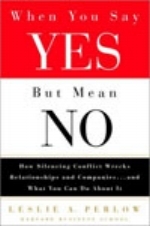 “Saying yes when you really mean no” is a problem that haunts organizations from start-ups to multi-nationals. Worse yet, as Leslie Perlow documents, the act of silencing conflict may create the consequences we most dread. Tasks frequently take longer or never get done successfully, and silencing conflict over important issues with people for whom we care deeply can result in disrespect for, and devaluing of, those same people. Each time we silence conflict, we create an environment in which we’re all the more likely to be silent next time. We get caught in a vicious “silent spiral,” making the relationship progressively less safe, less satisfying, and less productive. Differences get glossed over, patched over, and suppressed . . . until disaster happens.